Citizen Watch NH8388-81E. Include CITIZEN Gift Box. The Watches do not include a box unless indicated in the title or in the specification that there is a box. Dial Color - black. Case : Stainless Steel. Water Resistant - 100m. Citizen Watch NH8381-12L. Include CITIZEN Gift Box. Band : Rubber Color Black. The Watches do not include a box unless indicated in the title or in the specification that there is a box. Citizen Watch NH8384-14E. Include CITIZEN Gift Box. Band : Black Rubber. Case : Stainless Steel With Gold Bezel. Size : 45mm. Water Resistant - 100m. 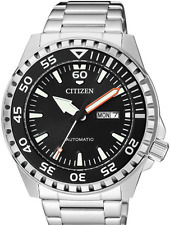 Citizen Watch NH8373-88A. Include CITIZEN Gift Box. The Watches do not include a box unless indicated in the title or in the specification that there is a box. Case : Stainless Steel. Water Resistant - 100m. Citizen Watch NH8380-15E. Include CITIZEN Gift Box. Band : Rubber Color Black. Case : Stainless Steel. Size : 45mm. Citizen box, warranty and instruction booklet. Unidirectional rose gold tone rotating bezel. Black heavy duty silicone rubber band. Bilingual (English Spanish) date window. Black dial with white-orange and luminous hands and markers. Citizen box, warranty and instruction booklet. Unidirectional black ion coated rotating bezel. Black heavy duty silicone rubber band. Bilingual (English Spanish) date window. Black dial with white-orange and luminous hands and markers. Watch ShapeRound. Face ColourBlack. We fully understand that buying an expensive item over the internet can be a very anxious process. That allows you to have the watch fully inspected locally. Case MaterialStainless Steel. Japan made CITIZEN. new military nato strap installed for this sale. I DESRIBE THE WATCH THE. very attractive case in great condition. SALE, MUST READ THROUGH! the pics added are exectly what youll get! Watch Citizen. - dial window material type: mineral. - band material: stainless steel. - model: NH8389-88L. Case material: Stainless Steel. Band material: Stainless Steel. Dial window material type: Mineral Crystal. 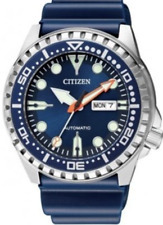 CITIZEN AUTOMATIC MARINE SPORT WATCH NH8380-15E calibro 8200 ancora in garanzia. CITIZEN AUTOMATIC MARINE SPORT WATCH NH8380-15E calibro 8200 ancora in garanzia.. La condizione è pari al nuovo, in più regalo doppio cinturino in cordura stile NATO di colore nero. Viene spedito in assicurata. 328 5509004 oppure 340 0729809 anche su Whatsapp. 0783/859104 dalle ore 9:00 alle 13:00 e dalle 17:30 alle 20:00. Dial Colour: Black. Strap Colour: Black. Watch Details Clasp Type: Pin & Buckle. Case Material: Stainless Steel. Model Ref: NY0040-09E. Strap Type: Silicone/Rubber. Its only been used as a desk diver in rotation with other watches. Watch Specs. Power reserve 40 hours. LUNETTA INTERNA NON RUOTA, FONDELLO CON REFERENZA 6119 7103. BUT NOT POLISHED. The Watch is in Really Rare in This Condition. NOTICE : We Can Not do Warranty for Water Resistance. Watch Citizen. - clasp type: foldover. - band colour: silver. - band material: stainless steel. The Watch is in Really Rare in This Condition. NOTICE : We Can Not do Warranty for Water Resistance. Cassa: ACCIAIO PVD ORO ROSA CON FONDELLO A VITE. Spessore Cassa: 11,5 MM. Bracciale: GOMMA CON CHIUSURA AD ARDIGLIONE. Misura: UOMO 46 MM. Quadrante: NERO. Glass: MINERAL. Water Resistant: 10 ATM. Case: STAINLESS STEEL PVD PINK GOLD.